I saw this movie about a year ago, and I fell in love instantly. I highly recommend you watch this movie if you like war/romance films! The best gypsy movie ever in my opinion. Subscribe to me on YouTube and enjoy the video review! For the rest of October, I will only be doing horror/suspense movie reviews to really get in the Halloween spirit! Look for my upcoming reviews in the horror genre forum! I watched this movie a few years ago. It was very memorable. It's one of the last starring roles Dietrich had at Paramount, her home studio in Hollywood. Milland is an interesting choice as costar, coming off his Oscar win for THE LOST WEEKEND. But it's really Mitchell Leisen's skillful direction that makes the film must-see. And as you indicated in your review, Dietrich allows herself to be very uninhibited which adds to the fun. I don't think she cuts loose so much in most of her other films, except for maybe DESTRY RIDES AGAIN. 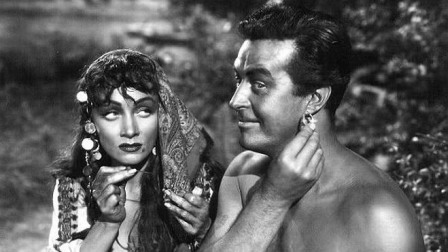 Yes, I saw "Golden Earrings" (GE)about 10 years ago--very enjoyable but somewhat silly film--Mitchell Leisen's direction keeps things moving & film doesn't get too serious--that's my viewpoint. You got the (what I think funniest) story in the review--about Marlene, Ray, & the cooked fish head--major kudos for that. You got the spirit of the film over in words (a hard thing to do)--congrats. You went at the film from a serious angle--I would (and did) just look for the silliness when I saw GE--you got both angles across--good job. Mitchell Leisen, one of the most hated directors in Hollywood... But, he did some good pics, for sure.